Do More Than Train Your People, Elevate Your Workforce. 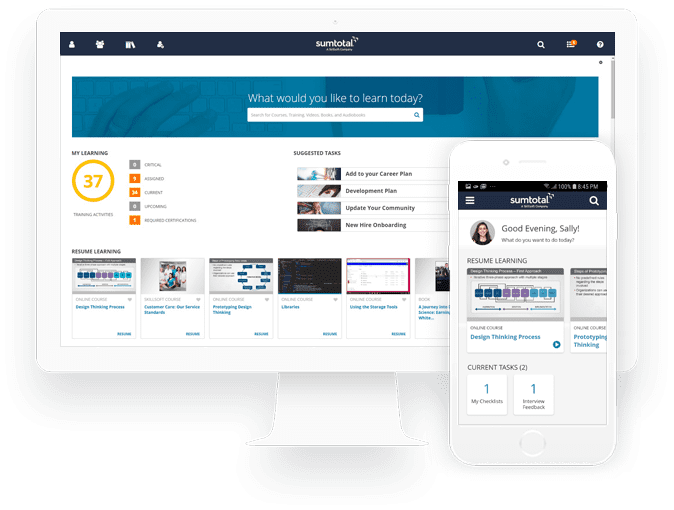 To win in today’s agile, competitive environment you can’t rely on old school learning management systems (LMS) that provide one-size-fits-all training. SumTotal Learning Management is the only enterprise LMS that connects the dots between the skills and competencies people need now–delivered in the context of what they are trying to accomplish – and, prepares the organization for tomorrow, to measurably improve performance. SumTotal Learning Management delivers an unrivaled learning experience. We’ve included the best parts of Percipio (learning experience platform) to deliver expertly designed content, minimize the burden of constant curation, enhance content discovery, and utilize usage analytics. Regardless of where learning occurs SumTotal Learning Management can track it. SumTotal’s learning experience is modern, engaging, consistent and trackable. Learning Anywhere, Any Time, On Any Device. Give your employees a personalized learning experience, right in the palm of their hands. Relevant learning served to any device helps increase worker productivity – ensuring they have a seamless connection to courses and content right in the flow of work. 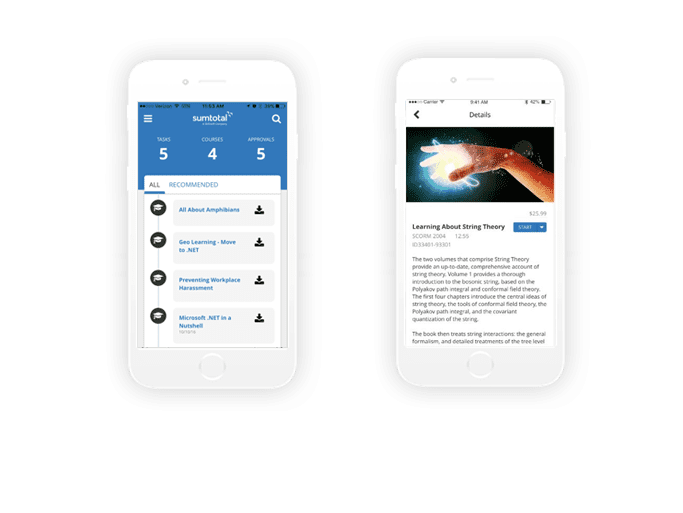 The SumTotal Mobile App puts continuous learning within reach for both online and offline learning. Your organization can take learning beyond the office walls and provide training to learners outside of your company. 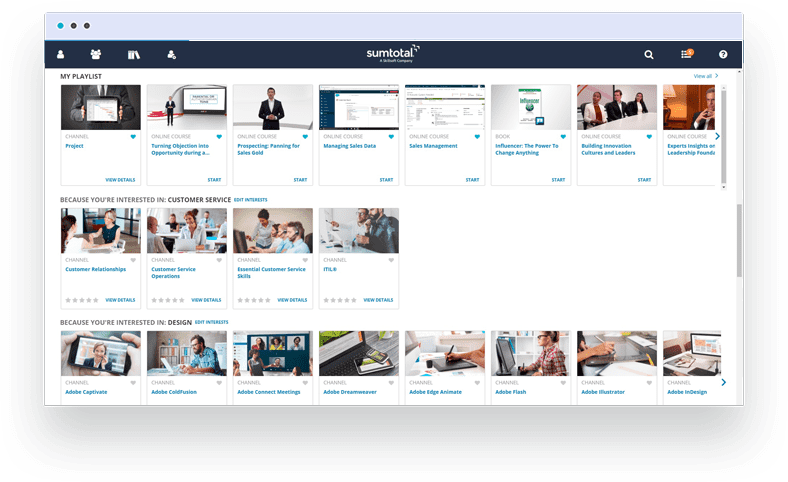 With SumTotal’s Extended Enterprise capabilities your organization will deliver a seamless experience – educating your customers and improving satisfaction. In addition, you can use learning content as a potential new revenue source for your organization. SumTotal Growth Edition is scalable and designed for fast growing organizations. Set up within hours through rapid deployment, we enable your users to access online training right away. Our solution supports features such as instructor-led or webinar training, additional learning resources, and approvals. All are easy to turn on and configure when you are ready to use them. The Skillsoft Organizational Maturity Index™ and diagnostic tool offers a practical methodology for organizations looking to make tangible improvements. The index meets each organization where they are and provides practical guidance to reach higher levels of excellence. We’ll walk you step-by-step through the process of addressing your immediate challenges, building alliances throughout your organization, and making a successful business case for LMS. SumTotal works in harmony with your existing systems, with a unified architecture that allows you to deploy and maintain the solution with ease – with the flexibility to build out the solution suite as your needs and maturity evolve. We’re one of the only providers to empower customers to deploy the way that suits your needs, whether that’s SaaS, Hosted or Premise installation.